There's not much that's new in Maybelline's Fashion Rocks displays. I spotted a couple of them a few weeks back and scoured everything in them so I could give G. of Nouveau Cheap a full report. I'm a bit let down that there aren't new LE shades of their Color Sensational gloss, because the two I bought last year are great. The only new things here are four LE Color Show polish shades. In keeping with the music theme, they all have song-inspired names. I'm old, so I caught the references in Plum As You Are (Nirvana) and I Got You Beige (Sonny & Cher) right away. Greyzy In Love took me a second, but the Beyonce connection dawned on me after a little thought. Fashionably S-late stumped me completely. I had to google it. Falling In Reverse? Ok. Maybe that one's just coincidence? Anyway...I first found the displays at Walgreens and Wegmans, but held out until I found one at my favorite CVS location over the weekend. Plum As You Are and Fashionably S-late had to be mine! Fashionably S-late is a slate gray cream. 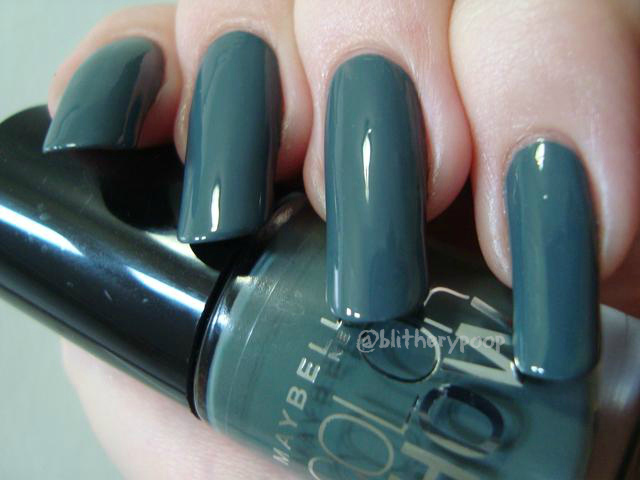 In Walgreens Fashionably S-late had looked like a slightly greenish gray. At CVS it looked much greener and I decided I needed it. It's bluer and darker on the nail than I'd expected, but I like it a lot. It reminds me of Sinful Colors Leap Flog, though I don't think they're exact dupes. Formula-wise I have good news and bad news. The good news? One-coater! The bad news? Pinprick bubbles. I'll thin it before wearing it again. I feel like I could maybe get away with it as an accent nail in a work mani when my nails are shorter. Maybe. Plum As You Are is a deep gray cream with fine fuchsia shimmer. Sometimes a polish almost haunts your dreams. Plum As You Are had been in the back of my mind since I spotted it, and I'd pick it up and "hmmm" every time I saw it at a store other than CVS. My will almost weakened. I had to know how that shimmer translated. As you can see, it's hidden-ish. The base is so thick and opaque that the shimmer is a highlight more than anything else. It's not bold, but it's a cool effect. The thickness causes another problem though. 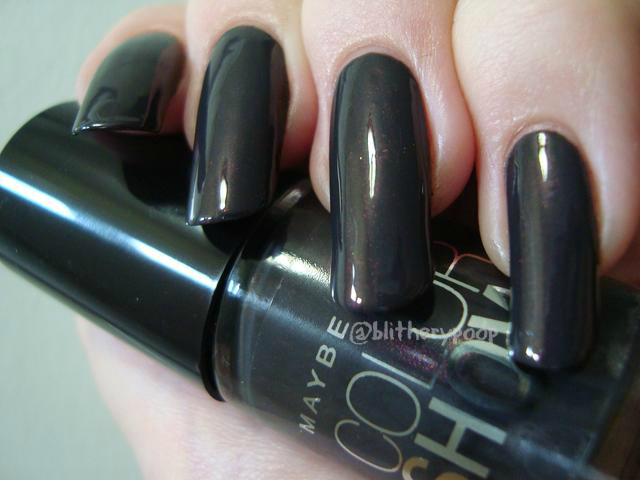 It makes application kinda draggy, especially when that skinny brush is used on wide or long nails. This is two coats because I had to even things out. I got a bit of bubbling here too. I'll be thinning this one also. Bottom line: Both have so-so formulas, but the colors are striking. Fashionably S-late might satisfy a Sinful Colors Leap Flog lemming too. That brings me to a question... Should I do a comparison roundup post? Are there any fall polishes I've posted lately that you'd like to see compared to anything else in my stash?